We all love glitter nail polish (whether you use it for an accent nail or on all 10 of your digits), but we all hate removing glitter polish too! In the past, before I knew about the ‘foiling trick’, I used to only wear glitter polish on an accent nail (this is where one nail is painted a slightly different colour or finish to the other nails) and that was it. I dreaded the whole removing glitter polish process, all the rubbing and scrubbing was too time-consuming and frustrating. About 2 years ago I was having a look-see around Pinterest and saw a picture of a girl who had foil wrapped around her fingertips. So I thought to myself: “She does know aliens don’t control your mind through your fingertips, right?” But the photo piqued my interest, and so I clicked to see what the blog post / article was about. And with the click of a button, my life would never be the same again! Quite the drama queen, I am… I now apply glitter polish to my nails (sometimes even all 10 of them) without so much as a flinch or blink, because I know removing it, is a breeze. I have seen quite a number of girls (especially in South Africa) complain about the hassle of removing glitter polishes, and when I asked them if they knew about the ‘foil method’, they said no. So I’m probably correct when I say most of you girls also don’t know about this miracle method and that’s why I’m doing this blog post today. ♥ Nail polish remover (the Essence Nail Art Nail Polish Remover Ultra is my favourite for this). ♥ Cotton balls or cotton rounds (cut into smaller pieces). ♥ Aluminium foil (cut into sizes large enough to be wrapped around your finger). 1. Saturate the cotton ball or cotton round with nail polish remover and place the saturated cotton piece on your nail. 2. Wrap the piece of foil around your fingertip (it doesn’t matter if the matte or shiny side is on the outside). Make sure it’s firmly wrapped around that little finger, so that the nail polish remover doesn’t evaporate. Wait 5 – 10 minutes depending on what sort of nail polish remover you’re using (the Essence Nail Polish Remover Ultra takes about 5 minutes & the Cutex brand takes about 10 minutes) and how many coats of glitter you are wearing. Do one hand at a time as wrapping the foil around your fingertips (without tearing it) while you already have foil wrapped around your one hand’s fingertips, gets a bit tricky. I do this while I’m sitting in front of the TV watching an episode of my favourite series – that way it doesn’t feel like wasted time (add a cup of tea or glass of wine & you’re all set!). 3. After your 5 – 10 minutes is up, you’re all set to remove the foil. Unwrap the foil carefully (because then you can use it again), apply slight pressure (press down on the nail) and slide the cotton off the nail. 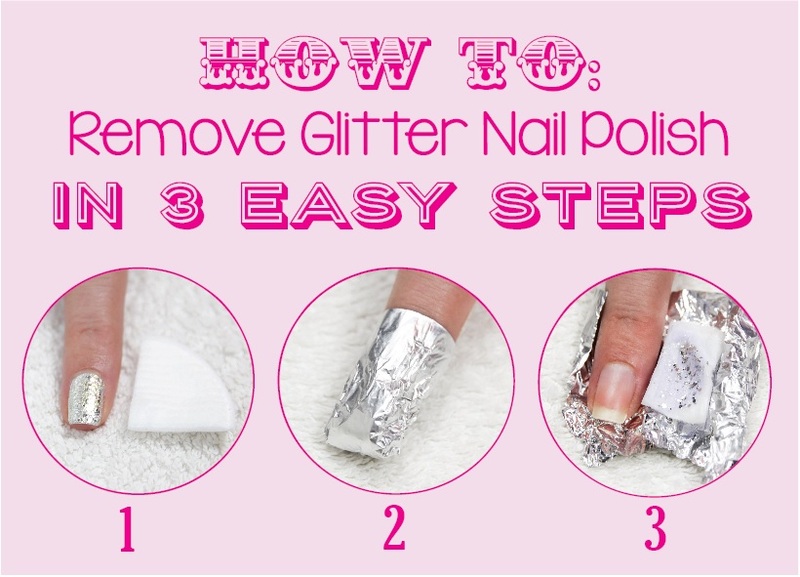 All or most of your glitter polish should slide off quite effortlessly! Remove any left-over pieces of glitter with another cotton pad and some nail polish remover (there shouldn’t be a whole lot of glitter left on the nail though). I like to wash my hands to remove any residue from the polish remover (as this tends to dry out the nail and cuticle area) and apply a generous amount of my favourite hand cream or cuticle butter (my favourites are Soap & Glory Hand Food and LUSH Lemony Flutter Cuticle Butter). I used to also use the Essence Peel Off Base Coat (I have this in my nail polish stash and use it from time to time) – but unfortunately it has been discontinued. I’ve also read adding a thin layer of Pritt Kids Glue (the liquid one in the red bottle) or Modge Podge (for all you crafters out there) as a base coat will help the glitter polish peel right off! Happy Monday! And hurraaaah for a short week! This is aaaaawesome! Im putting on some glitter polish tonight to test it out – wow! MY LIFE HAS BEEN A LIEEEEEEEEEEEEEEEEEEEEEEEE! Thank you for this blog post, Lu, you have changed the way I look at glitter polishes. Now I can buy all the glitterz I want and not worry. Not sure why I didn’t think of this since I regularly use the foil method to remove gelish (now that is one awful DIY process). Will certainly try it next time I put some glitter polish on. Oh wow! I never knew you could use foil to remove gel too!? Awsum stuff, this sounds so quick and easy!!! Definitely will try it out – have glitter polish on now but I DREADED GETTING IT OFF. So thanks for sharing! I’m pretty sure the foil method will work for the Fuzzy Coat nail polish, I’ve used this method on non-metallic glitters (plastic ones) and it worked for it too! I absolutely HATE taking off gel or glitter polish. I may just have to rock a glitter mani soon…thanks for sharing with us, Luzanne! Thank you Luzanne! I googled this method after you recommended it on Instagram and it really works! Thank you so much 🙂 I haven’t used glitter in 6 months because of the hassle of removing it. What a great helpful idea! Thanks a lot!